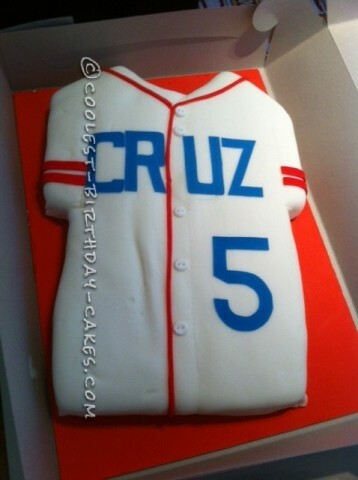 My grandson Cruz was having a baseball themed party to celebrate his fifth birthday. I usually bake my grandchildren’s birthday cakes, so I wanted to make this one unique and special. I baked two 13×9 inch cakes: one chocolate and one vanilla. I iced them together with butter cream frosting and after chilling them about an hour, trimmed them into the shape of a baseball jersey. Then I crumb-coated the entire cake with more butter cream icing. This was a pretty large cake, so I made fondant to cover it. I made a LOT OF FONDANT to cover it! It wasn’t difficult to make, but I could have used some help when I covered it. Such a large sheet of fondant was rather heavy and difficult to manage – but I succeeded! I applied the fondant so that it would look like fabric, complete with a slight wrinkle. I wanted it to look like he had just laid it down. I then made fondant buttons, colored and cut out the letters “C” “R” “U” and “Z” and the number “5” and placed them on the “jersey” along with fondant trim. The cake was a hit! Some people commented that it didn’t look like a cake, but an actual jersey! My grandson Cruz loved it. Needless to say, I was very proud and happy. It tasted really good, too. I had used commercially-made fondant in the past, but homemade tasted so much better. I plan to always make my own in the future. I’ve made many cakes for my grandchildren: volcanoes, castles, basketballs…I can only imagine what they will want next!